By the 1990’s a lot of the Italian character that had charmed Western Australians had disappeared – with the exception of a few Italian restaurants, butchers and delicatessens. The Little Italy of the past was no more. An attempt to commemorate Northbridge’s Italian heritage, included the construction of a “Piazza” which resembled nothing like its Italian namesake. As we entered a new millennium, it seemed the memories of “Little Italy” would simply remain just that, a memory. 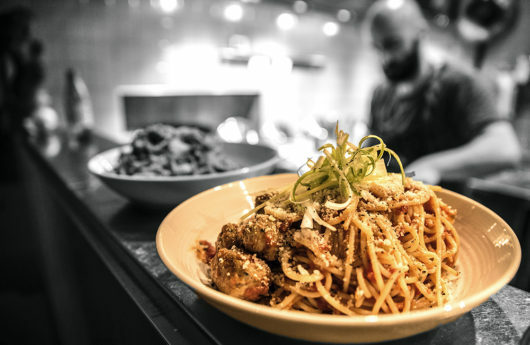 Fast-forward to today and Northbridge is re-embracing its Italian roots, thanks to the innovative minds behind eateries like Dough Pizza, No Mafia, Francoforte Spaghetti Bar and ChiCho Gelato. Gone are the days of checkered tablecloths, faded Ferrari posters and outdated Azzurri memorabilia. These eateries have espoused a new wave Italian style. They respect tradition, but embrace change and have established eateries with a menu and fit out that are chic and sophisticated, and most importantly classically Italian. Locals would have thought Dough Pizza owners Sacha and Shelly Grewal were out of their minds, opening an authentic pizzeria in an area where Italian restaurants had been closing left, right and centre for over a decade. The restaurant is on the outskirts of Northbridge away from the bustle of where Little Italy stood, as in the 90’s the suburb transformed from an ethnic neighbourhood into one of Perth’s most violent areas, due to the increasing number of nightclubs. Four years on and the number of pizzerias, like any good dough, continues to rise. “We like to make people feel like they’re in somebody else’s home having dinner”, says Dough manager Seonaidh Murphy. And as someone of Italian background, it’s hard not to feel at home. The pizzeria is decked out with wallpaper of black and white family photographs, vintage movie posters and a collage of Italian playing cards, that makes one fondly recall the briscolamatches of their childhood. The fact that families are dining in Northbridge again is an achievement in itself, as it was no longer deemed a family friendly area. Dough is popular among newly arrived Italians. Tommy Colombo, who hails from Milan and works front of house, says it’s their modern approach that makes it popular. “What I see in Italian restaurants abroad is it’s all about tradition and origins, which makes it boring…here there’s quality, there’s not that old feeling…There’s a mixture of traditions of food and wine, and the way it’s laid out is new and funky”. Another William Street hotspot, No Mafia has topped the list of local foodie’s most popular restaurants since it opened. Part-owner Emma Ferguson believes it’s Australia’s familiarity with Italian cuisine that has seen a renewed interest in Italian food. “Spaghetti and lasagne are part of Australian heritage now. I think we’re all familiar with it but when you sort of focus on it that little bit more people become more interested in it”. While Ferguson is not Italian, she claims “Italians just do it best”. “Nothing beats an espresso at 3:00 in the afternoon or a Campari at 5:00…it’s just classic. We just don’t eat like that”. Ferguson’s travels throughout Italy inspired a number of menu items, including their infamous ‘Nocello Limonade’. “I got really lost and walking for hours near Porto Cervo… there was so much food growing, I was picking fennel, lavender and lemon, and so I came up with a cocktail, that was lavender and limoncello”. The restaurateur credits Palermo’s street markets as the inspiration for their seafood dishes. “I believe street food is the best way to eat…and I believe Palermo is one of the best street food cities in the world”. Restaurateur Julian Staltari’s parents operated Dino’s Coffee Lounge on William Street in the 60’s, and now Staltari is making a name for himself with Francoforte Spaghetti Bar. Francoforte’s impending launch was rocked by Jamie Oliver’s announcement that Jamie’s Italian was opening up nearby. “We opened up at the same time, but people compared us better than Jamie’s, even without fresh pasta”, he said. As Sofia Loren famously claimed, “everything you see, I owe to spaghetti” and the same can be said for Staltari, who is opening a paninoteca next door. Like any true paesani, No Mafia and Francoforte have welcomed the newest addition on the block, ChiCho Gelato with open arms. The gelateria of husband and wife duo Cesare and Carly De Bartolo has collaborated with the restaurants on a “Tre Amici” campaign, where patrons embark on a progressive dinner through “Little Italy”, with antipasto at No Mafia, a primo at Francoforte and dolce at Chicho. The campaign is one of several collaborations that Chicho has been involved with since opening in January. The store supplies gelato for several bars in the area and frequently collaborates with local chefs on unique flavours like maple bacon with marshmallows and Manjimup truffle with honeycomb. “We’ve never seen something and said I want to bring it back to Perth. We see ourselves as quite original and innovative”, says Cesare. While ChiCho offers innovative flavours there are also the classics. “All the Italians line up for Sicilian Pistachio to test me”. And the Italian community have embraced ChiCho, which serves gelato in the traditional pozzetti. “When we first started we had fig on the menu…these Italian ladies would drop figs off and I’d have to chase them. Even though we had suppliers these ladies would drop figs off to our shop…it’s very special when we can connect to people like that”. The future of Little Italy is in safe hands with these creative entrepreneurs. Unlike the competitive owners of the pizzerias and coffee lounges of the past, these new wave restaurateurs are unique and work collaboratively with one another. They’re not afraid to be innovative, yet they have maintained that classic Italian flair. It seems La Dolce Vita has finally returned to Northbridge.